The Alabama State Bar Volunteer Lawyers Program Committee recently recognized the Public Interest & Community Service Organization (CPICS) at Samford University’s Cumberland School of Law. The CPICS was chosen to receive the 2015 Alabama State Bar Pro Bono Award in the Law Firm/Group Category. CPICS members include third-year student Sam Boukli-Hacene of Decatur, Georgia; second-year students Rae Bolton, Jacksonville, Florida; Jessica Catlin, Sylvan Springs, Alabama; Amanda Herren, Mobile, Alabama; Emily Irvin, Eufala, Albama; and Elise McFall, Bluff City, Tennessee; and first –year students Depri Hale of Lakeland, Florida; and Lee McLean of Vestavia Hills, Alabama. This academic year, the CPICS has delivered more than 1,000 hours of community service to Jefferson County residents. The year began with the annual 1L Service Project, in which 90 percent of the incoming class served at five locations throughout Jefferson County, donating over 500 hours of service. 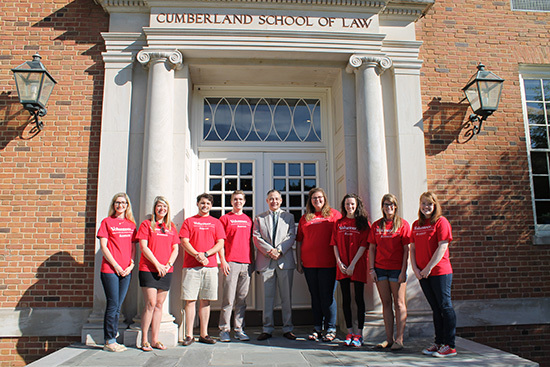 In October, the CPICS participated in Alabama’s 2014 Pro Bono Month, hosting five local events at the law school. For the first time this year, the CPICS participated in four Alternative Spring Break activities, hosted at four different homeless shelters in Jefferson County. The CPICS also hosted CASA Christmas, a fundraising drive for children in the care of the Court Appointed Special Advocate (CASA) program, and hosted a kickball tournament benefiting CASA children and their caregivers. The year culminated with Project Homeless Connect, in which students, alongside volunteer attorneys, provided free legal assistance to more than 300 people. The 2015 Alabama State Bar Pro Bono Awards will be presented at the Bench and Bar Luncheon July 16 during the state bar annual meeting. Polly Allen Manuel is marketing and communications coordinator for Samford University’s Cumberland School of Law.